GROM Audio has been an innovator in car audio hardware, developing a series of pioneering car kits that integrate Smartphones to car stereo systems. Their car kit integrates USB and Bluetooth connections to car stereo systems, and offers the ability to control and use Smartphone features via car stereo and/or steering wheel buttons. The company’s recent foray into car audio advancement is in the realm of Smartphone apps. Their latest Android App, DashLinQ, is a drive mode app designed to use essential Smartphone features such as entertainment, navigation and phone calls. The app is designed for drivers to provide a safe and seamless user experience. Using large icons and fonts, DashLinQ is simple and easy to understand, providing the access to key phone features and apps, optimized for in-car use. The voice commands are available for phone calls and GPS navigation. The user can switch between navigation and music with just one tap. Gesture controls are widely used within music plugins and SMS read aloud. DashLinQ offers unique music player plugins for WebRadio, Local music (stored on the phone), Google music and Spotify. The app provides many features that are attractive to an Android user audience. Among them are an intuitive interface, expanded browsing options, and several advanced features—including voice music search, favorite’s stations, and web station recordings. The DashLinQ App and the GROM Bluetooth and USB car kit make a “perfect couple.” A phone with the DashLinQ app offers a luxurious navigational display window and infotainment hub, while the GROM USB and Bluetooth car kit ensures seamless integration of the DashLinQ app into the factory car stereo. When a phone with a DashLinQ app is connected via GROM Bluetooth, both car stereo and steering wheel controls will be used for hands-free phone calls, along with “accept/reject” actions, and wireless music stream browsing. A USB connection via a GROM car stereo adapter offers even more advanced control and browsing options for music selections—whether by playlists, artists, albums and songs – all using car stereo/steering wheel buttons. In addition to that GROM provides exceptional sound from your Smartphone transmitted through the car stereo system. Making the connection between both app and car kit is a great way to offer GROM Audio customers the full, in-car connectivity experience. What this all means is the as long as you have your factory Bluetooth or GROM device in your car, DashLinQ will be connected to your car stereo system. 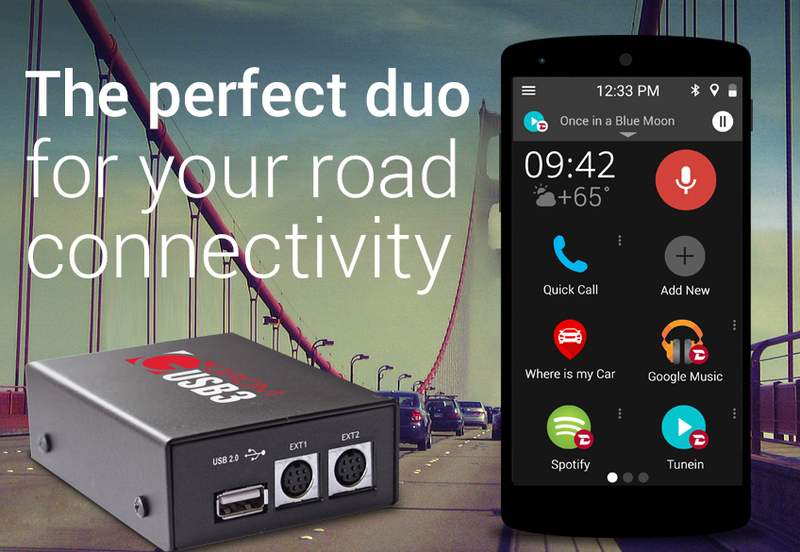 DashLinQ Bluetooth connections can only work with Bluetooth enabled cars; therefore, if the car is not equipped with Bluetooth connection, you can use Bluetooth connections via several of GROM’s Bluetooth car kits: GROM-BT3: Bluetooth Hands Free and Audio Car Kit and the GROM-USB3: Android USB Bluetooth Car Integration. DashLinQ is free and can be downloaded on Google Play and other app store websites. If you’re already an owner of GROM Audio car kit, it’s almost like a software extension and a must own app. It is worth downloading and trying out. GROM Audio has a webpage specifically for people to learn more about their app.